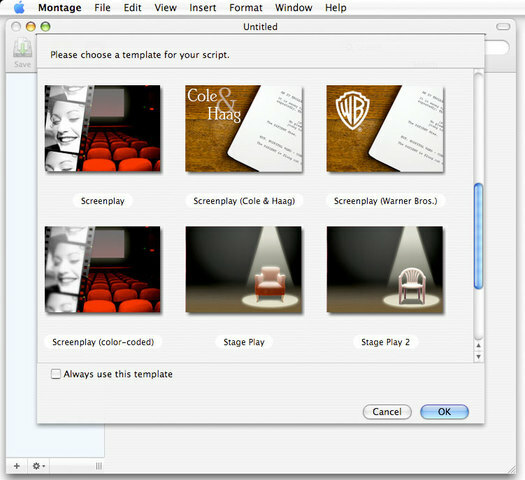 From the ability to import and export Final Draft documents to using custom pre-formatted templates for film, TV, radio, and theater, Montage guides both the first time screenwriter and the seasoned veteran from start to finish. But Montage doesn't stop there. 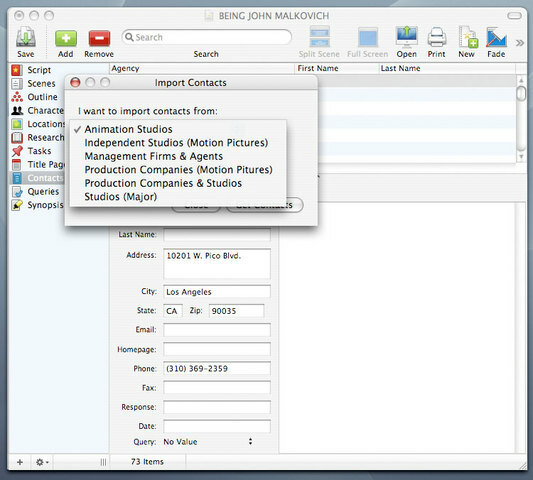 Once your masterpiece is complete, Montage allows you to submit, track, and send your query, synopsis, and scripts to hundreds of included industry contacts through Montage's integration with Apple's Address Book. 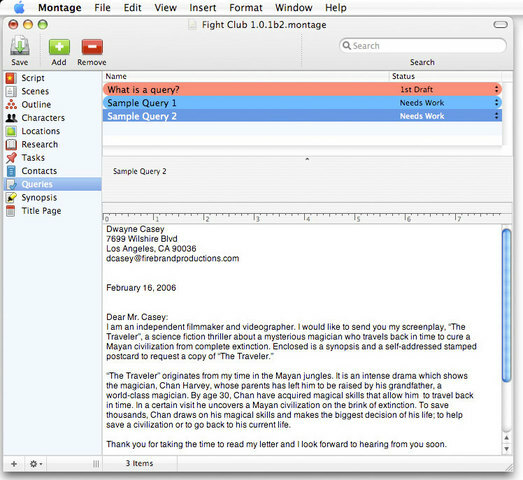 Montage was designed and developed solely for Mac OS X by a long-time developer whose commitment to Apple technology is reflected in the feature set. 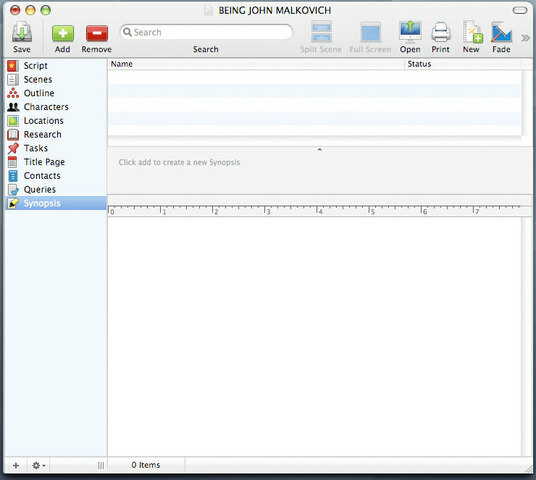 Montage is Intel-ready and fully supports accessibility features for users with vision disabilities. 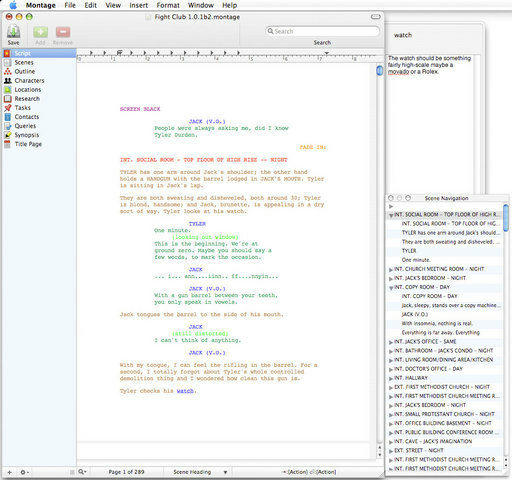 Viewing your script from different perspectives is critical. 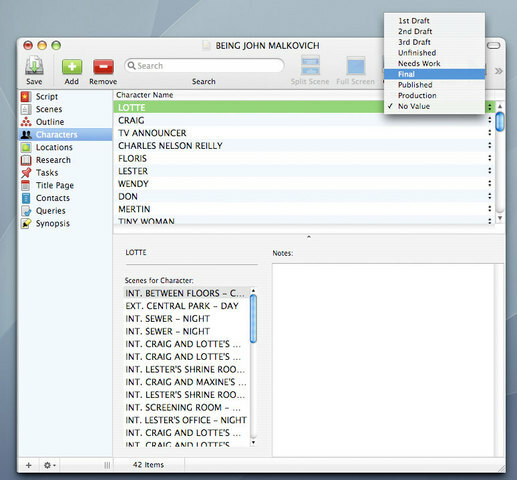 Montage provides several different views: live outline view, script view, character view, locations view, research and notes view, and tasks view. 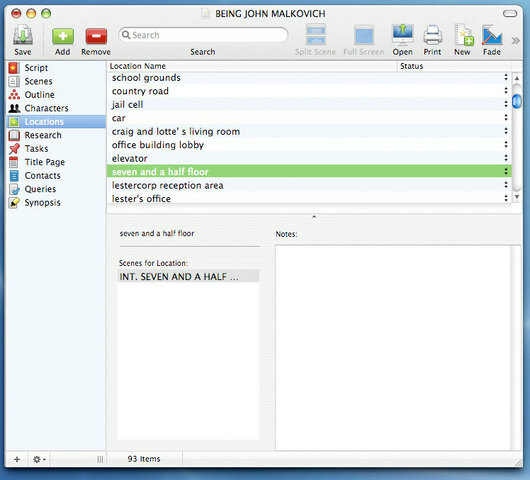 Its pride and joy, the live outline view, allows you to write your script unlike any other screenwriting software by helping you make scenes, add characters to those scenes, and take notes, without actually writing the script. 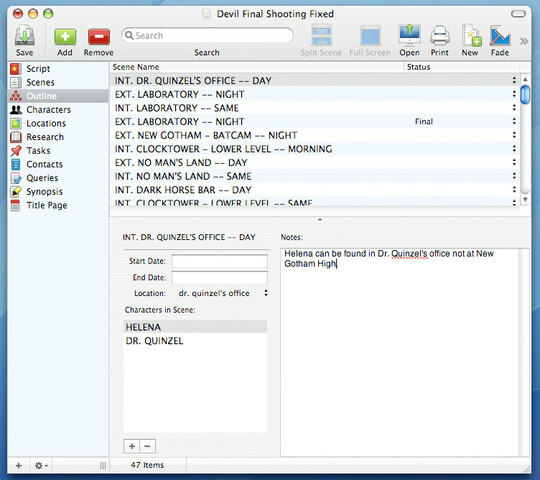 And to top things off, Montage Smart Views even allow writers to visually filter the script to the desired content, based on criteria. 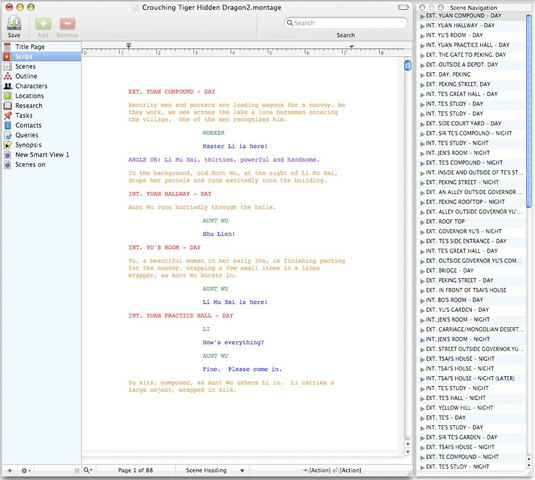 One of the most difficult steps in the "I want to write a movie" scenario is not necessarily the creation of the script, but getting it into the proper hands when it's complete. 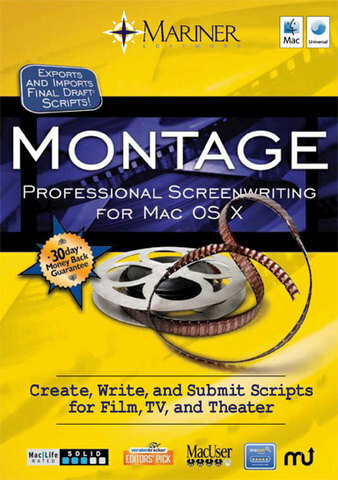 Now, it would be foolish to guarantee a six figure movie deal or a prime-time television contract just by using Montage...but why not improve your odds? 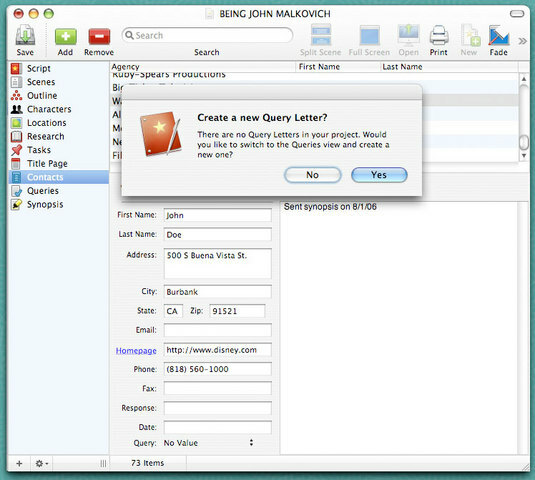 Montage helps you build a query letter and then provides you the ability to submit and track your query, synopsis, or scripts to hundreds of included industry contacts, including managers, agents, and production companies. 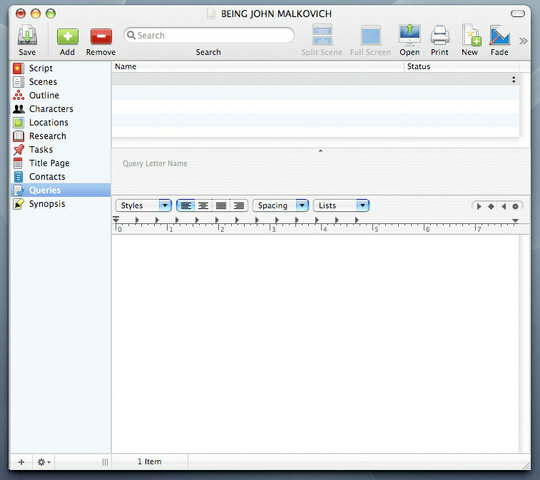 Melding the theory that a simple user interface, combined with powerful and intuitive features, provides the best writing experience, Montage makes it easy to create, edit, and manage screenplays on your Macintosh.